Directions, from Airport. Head north bound on the old N1 road to Swords. When you get to Swords which is 5 min. from Airport [ 4 km] you'll meet a lot of roundabouts. The first is the Pinnock Hill Roundabout, take 2nd exit continuing North bound on the duel carrageway, next roundabout is the Malahide Rd. Roundabout, take 2nd exit, next roundabout is the Seatown Rd Roundabout, take 2dn exit, at the next roundabout [ Estuary Rd] take 1st exit, at traffic lights turn right. The Swords Business Campus is located half a km on right. 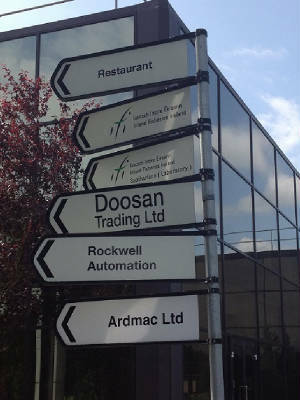 List of companies doing business at Swords Business Campus.